Lost power means lost stock, so you need good conductors to carry the charge on your electric fence. That's why we only use heavy-gauge materials that will withstand exposure to the elements, and will conduct the power over long distances of electric fencing. 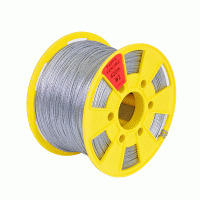 Heavy-duty steel wire is a perfect conductor, with little or no voltage drop over long distances. Use for electric fencing that will be left in place for several years. Galvanised to BS443A. 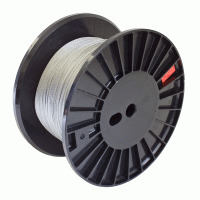 Our stranded steel wire is also available pre-loaded onto our Rappa Reels or Hand Reels, including a 600m length that is not available on these disposable reels. Lightweight, and easy-to-use, polywire is the ideal choice for strip-grazing and temporary electric fencing. 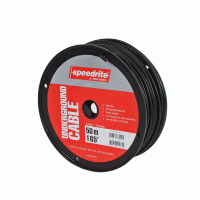 Our polywire uses only the highest quality materials for maximum conductivity and strength. 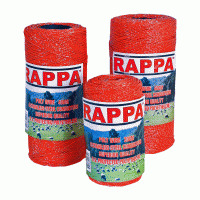 A highly visible option for horses and ponies, though less suited to windy conditions than polybraid or polyrope. We recommend 12mm polytape for temporary electric fencing, as it is less susceptible to wind, and 20mm and 40mm for more permanent electric fences. Polyrope and polybraid are tough, easy-to-use alternatives to polytape, especially in windy areas. 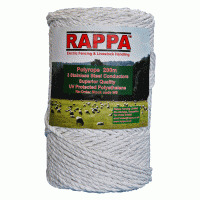 Polyrope is highly visible and easy to rewind, ideal for permanent electric fencing. 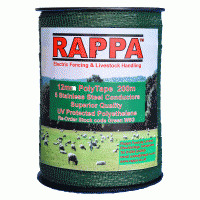 Polybraid is lighter and thinner, so excellent for temporary electric horse fences. 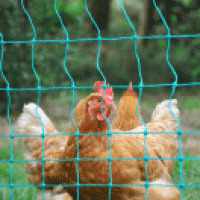 The closest you'll come to an electric fence in a box, electrified netting is perfect for smaller, temporary fence runs and acts as a highly effective deterrent, even for rabbits. Easy to install and move, electric netting is very forgiving - it adapts easily to slopes and dips in the ground and doesn't need tensioning. Custom-made for electric fencing, our heavily insulated cable is the only safe option for connecting mains energisers to electric fence lines and earth stakes, and for carrying the power across gateways. Use the Light Insulated Cable for above ground installation, and for use with energisers under 5 joules. For underground runs, or for use with larger energisers, choose our Heavy-Duty Insulated Cable or Superconductive Insulated Cable. 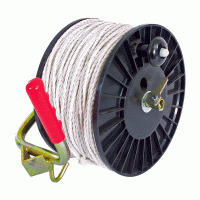 All the benefits of our robust Rappa Reel, without the hassle of loading the wire yourself. Erect electric fencing quickly and easily, with no risk of slack or snagging. All the advantages of our super tough electric fencing Hand Reel, pre-wound with varying lengths of stranded steel, polywire, polytape, polybraid, or polyrope.